DR SHE BLOGGO: Orphan Black 2.07 - "Knowledge of Causes, and Secret Motion of Things"
Orphan Black 2.07 - "Knowledge of Causes, and Secret Motion of Things"
Let’s just break this down for a second: this episode of Orphan Black was both sinister and absurd, equal parts mania and measure, comedy and disaster. Ladies and gentlemen? I believe we have found the episodic incarnation of Alison Hendrix. It’s obvious that Alison was meant to be the centerpiece of the episode, and it makes sense that her character traits sprawl outward from her place at the epicenter, wreaking havoc in both funny and awful ways. This calls back to the delightful season 1 outfit “Variations Under Domestication,” which served as a little sidecar of pastel suburban horror to Sarah’s squeeze between the cops and the corporation. Sarah imitating Alison? Check. Hiding a body from Alison’s peers? Check. Craft supplies in conjunction with bodily harm? Oh, check. Of course, when it comes to Alison, absurd ridiculata is usually followed by genuine terror and heartwrenching tragedy. So not only did we have the hijinx of trying to dispose of Vic and cover for Alison, but there was also Cosima learning that Delphine betrayed her trust, Alison discovering that Donnie participated in a “social experiment” with no knowledge of its real repercussions, and Rachel finding out that Dr. Leekie killed her mother. 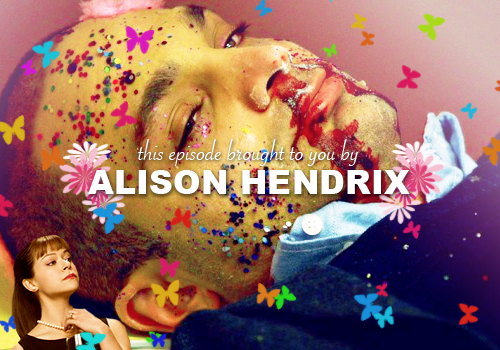 And of course, the errant gunshot that capped the episode and dropped all of our jaws - rounding out the hour as absurd, tragic, and violent - just like Alison herself. But Alison wasn't the only focal point of the episode - there was also Rachel Duncan. Helena was absent, and while Sarah and Cosima certainly had their emotional moments, the bulk of the screentime was devoted to Alison and Rachel, and the rapid unraveling of their worlds as they know it. Remember a few weeks ago, I charted Alison and Rachel as characters both wildly resistant to vulnerability? Neither of them can cope with a loss of control, and they both take great efforts to construct the world around them to the exact specifications of their liking. This connection between Alison and Rachel also makes the final moments of the hour more inspired than mere plot shock and gun horror. After all, the newest chasm in Alison’s life comes with the knowledge that Donnie’s affiliation with DYAD is laughably innocuous, even though it destroyed everything anyways. And the first crack in Rachel’s world comes with the earth-shattering truth that Leekie killed her mother and raised her in DYAD's image. So with these control-centric ladies spiraling into terrifying and uncharted new worlds, who should cross paths at the end of the episode but the two men whose actions were the cause? It’s also a huge statement to set up Leekie as a powerful villain in this episode, and let Donnie Hendrix kill him with an errant bullet. We learned Leekie was the Mad Scientist, the Villain, and Donnie was the Fool - and yet it’s the fool who puts a bullet through the Villain’s brain. For a man attempting to design an outcome, it's awfully ironic he was felled by happenstance. For Donnie, it's accidental vengeance, an irony of agency - suddenly the extension of Alison has power, just as the extension of Rachel does not. Moreover, it's a new Secret Motion of Things to push us forward into the final act of the season. Of course, with Aldous Leekie’s demise waiting at episode’s end, Orphan Black revealed a new stratum of power within the DYAD corporation: Dr. Marian Bowles. Here’s a new shadowy figure for us to observe and suss out - because with DYAD in particular, power dynamics are nebulous and shifting. Every episode adds new information that reveals a different dimension to the chain of command. The heads of this beast twist and snarl, and we only learn how it operates if we pay close attention. Here’s what we know about Dr. Marian Bowles: upon first glance, she appears to be a scientist. But then, you realize her pristine white coat is not of a laboratory but of an office. She is a well-groomed businesswoman, silver-tongued and shark-toothed. She gives Leekie the impression it’s the two of them against Rachel (she’s even costumed the same as him during their meeting - white exterior, black underneath) - when in fact, it becomes her and Rachel against him. After all, she and Rachel are to sit in the big chair. Not the lab coat, but the businesswoman’s coat. Marian is obviously meant to be another interpretation of Rachel - perhaps an amalgamation of Rachel and Sarah - and I’m curious to see if the show will present her as a pseudo-mother figure to Rachel, to match Leekie as her pseudo-father, and foil Mrs. S. as a mother figure to Sarah. Which leads me to another instance of having to Pay Very Close Attention to understand the true structure and inner workings of a design: in this case, of Rachel Duncan and her Nebulous Tucked-Away Emotions. She meaningfully interacts with two father figures in the episode: first with her adoptive father Ethan, who’s probably a shell of how she remembers him, and then with Aldous Leekie, the man who took her in and raised her as one of DYAD. Leekie hijacked Rachel as he hijacked Project Leda - and yet, Rachel shows him mercy when he’s meant to be disposed of. “Nurture prevails,” she says, without a single tear in her eye, leaning coolly against a desk, rattled but keeping it together. Compare this to her interaction with Ethan - who, it bears stating, is just the previous Nurturer for Rachel. He is not her nature - that we know of - he’s simply the man who came before Aldous Leekie as a Father Figure. We are not privy to the conversation that they share; however, in the moments leading up to it, we see tears shining in Rachel’s eyes and a fairly recognizable struggle for composure. Combine Rachel’s lack of emotion with her action of mercy, and a big question mark for how she interacted with Ethan - and we’re looking a mysterious puzzle of a lady. I’m guessing Rachel Duncan understands her own emotions even less than we do, so watching this shake out is going to be interesting. “Nurture prevails” is of course a big statement to come out of the mouth of one of the characters on this show, given the constant push and pull between nature and nurture as indicators of someone’s identity, appearance, and behavior. It's also applicable to a few other situations in the episode. Nurture leads Rachel to make her choice; Nurture gives Sarah similar destructive calculations as her adoptive mother; Nurture connects Alison to her adopted children; Nurture brings Felix to Alison’s aid, and Sarah to Alison’s aid, and Sarah to Cosima’s aid. Nurture is fingerprinted all over the episode, with one notable exception: Cal Morrison. Cal is biologically connected to Kira, and, while having been absent from his role as Nurturer, takes up the mantle through his biology as genetic dad. The idea of a study in nurture spins a few facets in new light. What exactly comprises nurture? If nurture is caring for someone, cherishing and fostering and encouraging - then Orphan Black presents us with a variety of flawed expressions. Delphine is tragically intent on nurturing Cosima, at the expense of Cosima’s agency and Kira’s potential safety. Alison loves Donnie, but the way she shows it can be destructive for him. Mrs. S does what’s best for Kira at the occasional expense of Sarah; Leekie cares for Rachel but hides a devastating truth from her; Donnie loves Alison but allows for social experiment on his family. In short: Helena is not the only character on Orphan Black that loves imperfectly through misaligned expression, and thus nurture is rendered in a gray area as a function of good intent, personal agenda, and difficult circumstance. As we move forward, it seems the best example of nurture is perhaps exemplified with Sarah: with Cosima's life on the line, she seems ready to bring Kira in to DYAD and negotiate a cure. Given that Sarah's original character construction hinged on Kira and Kira alone, it's a huge statement about her development if she makes this choice - even if she's running a con. Sarah and Cosima may share identical DNA, but it's the relationship and the circumstances that are informing Sarah's decision. Nurture prevails, indeed. “FINKS AND RATS AND SNITCHES AND FUZZ” is the greatest assembly of human language, ever. WHAT’S NEW WITH PAUL: we found out he likes pottery! And that’s it for this week on WHAT’S NEW WITH PAUL! When Cal told Sarah he has people in Reykjavik, I half-expected her to say, “But I have people here.” And then I would’ve cried. Sarah Manning's family arc, everybody. Sniff. Can’t lie; I felt a genuine pang of sympathy seeing Cal watch Sarah go - probably wondering if he would ever see her or Kira again. I very dearly enjoy when Orphan Black reminds us that Alison has children, and is family-oriented not just in the comedic-soccer-mom way. Motherhood is such an important facet of this show, and Alison’s kids should be included in that. Not only that, but it’s a way to connect Alison to Sarah, and Mrs. S. - narrative connections that are personal faves - and a handy construction to keep Alison in the fold. Where does Rachel’s power hit a brick wall? When is she limited, because she’s a clone? I wait anxiously to find out.